Technology group Wärtsilä has received its first order for its recently introduced Wärtsilä HY hybrid power module, which combines engines, an energy storage system and power electronics. The contract has been signed with Italy-based Rimorchiatori Riuniti, owner and operator of some 100 tugs in the Mediterranean Sea region. The Wärtsilä HY will be dedicated to a project for a new 80 TBP (tons bollard pull) harbour tug, making it the first project to feature propulsion based on this innovation. 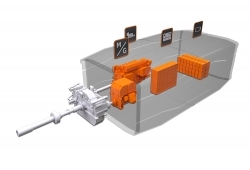 The Wärtsilä HY features a new integrated energy optimisation system (EOS) specifically designed for hybrid applications. Specific operational features embedded in the control logic of the Wärtsilä HY unit will enhance operational safety and environmental considerations when operating in waters adjacent to heavily populated areas. Lloyd’s Register has issued an Approval in Principle (AIP) certificate for the innovation. The certificate is based on technical material and safety analyses, concerning normal operation of the system and a presentation of risk scenarios.